A Contact Us form may now be added to any public page. When a visitor fills out this form, an email will be sent to the members of a selected Dynamic Subgroup. Past contacts may also be viewed from a new page on your site. Photos can now be uploaded directly from the calendar. Troop 772 of Tucson, Arizona! 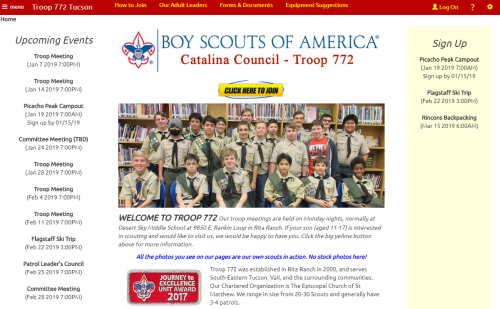 Troop 772’s website really excels in putting useful and important content at the fingertips of scouts, parents and prospects! Their Home page has a clean, professional layout. Note how they include a link to AmazonSmile as an easy fundraising tool. The How To Join Us page provides detailed information for prospective scouts, including costs and uniform requirements. And their Equipment Suggestions page is a real standout, providing an extensive list of essential and optional camping items, with links to online vendors. Your award certificate is on its way to you! Send us a ticket from the My Support Tickets page on your site's Help menu. This is absolutely the best way to communicate with us! Please see our User Guide for details. 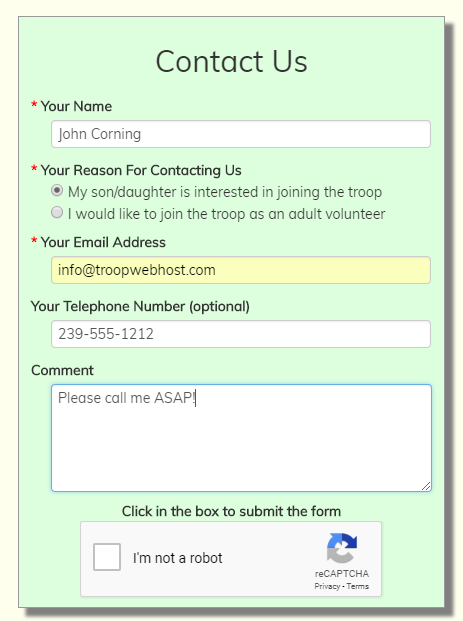 Or simply contact us at CustomerSupport@TroopWebHost.com. If you do, please include your unit number and city in your message so we can identify your site.